Schneider Dry Bulk driver David Mills was born in San Pedro, Calif., although he didn’t stay there long. David grew up in a military family, moving from city to city each time the family was transferred to a new noncombat assignment. It comes as no surprise that David would ultimately choose a career as a truck driver, allowing him to continue moving around the country on a day-to-day basis, yet affording him the comfort of a hometown at the same time. Following in the footsteps of his father, David began his professional career in the military, serving in the Navy as a boiler technician for eight years. After nearly a decade serving his country, David felt it was time to move on. Inspired by his uncle, whom David admired for his career as a professional truck driver, David decided to pursue trucking himself. As a kid, David saw how his uncle was able to just get behind the wheel and go. David wanted a lifestyle where no two days would be the same. This desire, combined with his experience moving all over the country, made trucking an ideal career option. Accustomed to working in a structured environment from his time in the military, David sought a trucking company with a similar level of consistency. He was impressed with Schneider’s unyielding beliefs and practices, evidenced by the company’s core values, which have remained the same for decades. David was especially impressed with Schneider’s commitment to Safety First and Always. David found that unlike a lot of companies out there, Schneider actually practices what it preaches. David has remained with Schneider for more than 24 years, driving van truckload for the first 10 and bulk for the past 13 years. David was also a training engineer for four years while he was in the van truckload division, splitting his time between driving and teaching new drivers the little things he learned over the years. Always on the lookout for new opportunities and learning experiences, David most recently began driving for dry bulk, a job that requires a lot of safety know-how. It makes him especially happy to be working for a company that takes safety as seriously as he does. 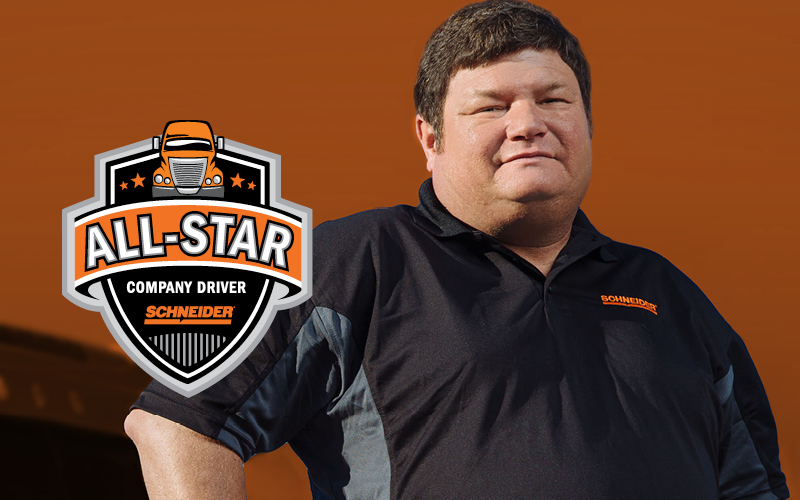 In addition to Schneider’s dedication to safety, David considers the support he receives from his Driver Business Leader (DBL) to be one of the best benefits the Big Orange provides. A couple of years ago, David’s family faced medical hardship when his wife had to go through two organ transplants. David’s wife got called into the hospital for surgery while David was supposed to be out on the road. David’s DBL, however, told him to take as much time as he needed. With that support, David was able to focus on helping his wife recover instead of worrying about his job security. David is looking forward to making two million miles with Schneider one day. With 24 years under his belt and a passion for the open road, David’s ambition will soon be realized. When it comes down to it though, David just wants someone to say to him, “Hey, you’re doing a dang good job.” So keep on hauling safe, David! What is Life Like as a Schneider Tanker Driver?